MIGUEL COVARRUBIAS | Geringer Art, Ltd.
Miguel Covarrubias was a Mexican painter and caricaturist, ethnologist and art historian. Dis-satisfied with the start of his career in Mexico, he moved to New York City in 1924, and drew for several top magazines. 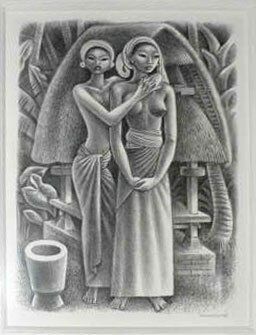 In the 1930s Covarrubias and his wife Rose made two trips to Bali where he made numerous works of art. Covarrubias also co-authored a book on Bali with artist Walter Spies.